If a tooth is cracked or chipped, it’s best to see a dentist as soon as possible. Broken pieces of tooth can be saved in some milk or plastic wrap if milk is unavailable. Take the chipped pieces with you to your dentist. If it’s a baby tooth, don’t try to replace it yourself, you may cause an infection or damage to the adult tooth behind it. However, if you are not sure if it’s a first or second tooth, put it back in its socket. The risk of permanent damage to an adult tooth not replaced is greater than the damage caused by a baby tooth being put back in. Locate the tooth and handle it gently. If it’s dirty, rinse the tooth in milk or in water (very briefly) to clean it. Try to place the tooth back in the socket within 5-10 minutes of it being dislodged. Take caret hat it’s facing the right way! Make sure the tooth is held in place by gently biting into a soft cloth placed between the teeth. Another option is to cover the tooth and the ones beside it with aluminium foil to stop it moving. If you can’t replace it, keep it moist by putting it in a small amount of milk or wrapping it in cling film. Immediately seek dental treatment- time is of the essence now. Handle the tooth as little as possible. Try not to scrape the tooth surface. Do not let the tooth dry out – keep it moist at all times. No ice, no hot water. While it’s ok to rinse the tooth for a second or two in water in the absence of milk, do not store the tooth in water.. If there is soft tissue attached to the tooth, leave it there. Preventing accidents such as tooth loss is imperative in contact sports. 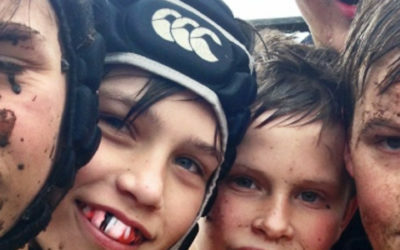 It is very important to wear a custom made mouthguard while training and playing contact sport or pastimes. To help protect you against painful and expensive injuries to your teeth and mouth, make sure you see your practitioner to be fitted for a customised mouthguard, it’s more comfortable, more protective and made for your personal protection.